Israeli PM says 'no coincidence' Iranian plot to bomb rally in Paris was thwarted. Israeli Prime Minister Binyamin Netanyahu hinted Wednesday night that Israel had foiled an Iranian attack in France. 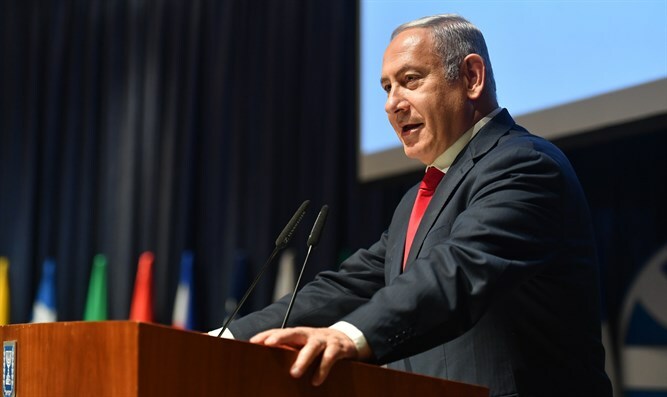 At a ceremony marking the 70th anniversary of the Acre prison break, Netanyahu spoke of the duplicity of Iran's behavior. "This week the President of Iran met with leaders in Europe in order to try and overcome President Trump's sanctions regime – and I tell you that this attempt will fail – even as Iran planned a terrorist attack on French soil in Europe." "It was no coincidence that this attack was thwarted," he said, hinting at a possible Israeli role in the foiling of the plot. "I call on the leaders of Europe: Stop financing the terrorist regime that is financing terrorism against you on your soil. Enough with the policy of appeasement and weakness regarding Iran." He added that Israel would always defend itself. "Against those who threaten to destroy Israel we are taking strong action to ensure the future of Israel." Four people, including an Iranian diplomat, were arrested over the weekend in connection with a plot to bomb a rally of Iranian dissidents in Paris.